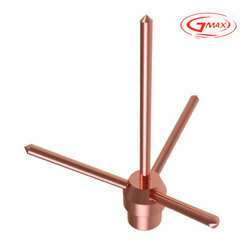 We are engaged in offering a wide range of this fint quality of Spike Lightning Earthing Rods to our valuable customers. 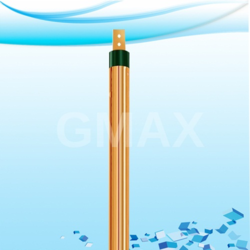 For protecting various buildings from the harmful effects of lighting, the offered rods are used. 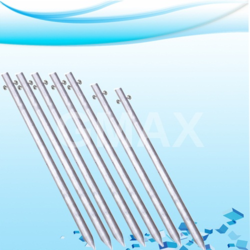 Determined to attain maximum customer approval, we assure the timely delivery of the offered rods within the assured time frame at the customers’ end. 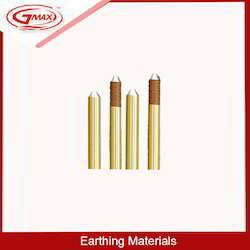 Manufactured as per the set industry guidelines, quality of this Earthing Materials, is highly standardized. 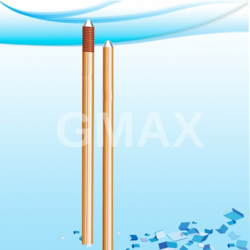 The finest raw materials and advanced technology applied in its making, this ensures the product’s capacity, conductivity and performance. In addition to this, the offered range is marked at the best rate possible. 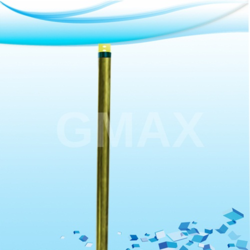 Gmax makes Portable Chemical Earthing Kit and Mobile Earthing is a respite to all mobile electrical, electrnic & communication equipments used in defense , space programs, intelligence agencies. 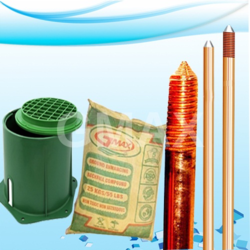 Portable Chemical Earthing Kit provides quick & efficient earthing. 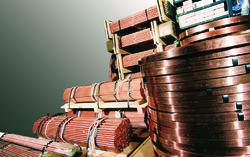 Proper earthing ennsures reference voltage (GND) for its functional needs. It is also the only safe path to conduct VHF, Harmonics, Surgers, Spikes, Unbalances, Short Circuit Current & other faults into the ground mass. 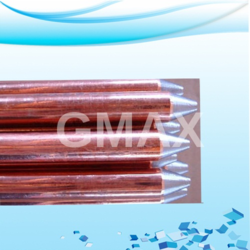 Earth rods are usually made from solid copper or stainless steel with copper bonding. 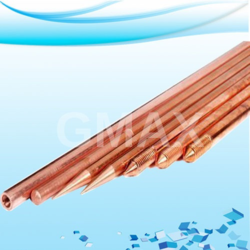 Copper Bonded Earthing Rods or Copper Bonded Grounding Rods are commonly used due to strength, corrosion resistance and comparatively low cost. 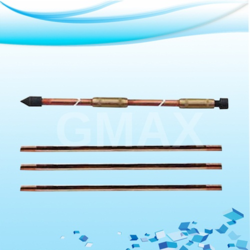 Our Copper Bonded Earth Rod System includes Clamps & Coupling, Driving stud etc. 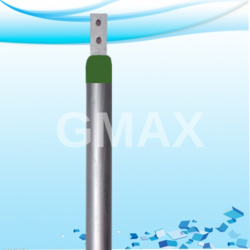 Size: 3/8".1/2". 5/8". 3/4". 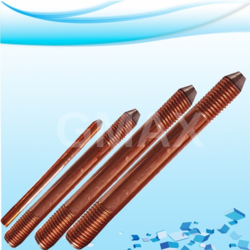 1"
We are the manufacturer of Copper Bonded Threaded Rods. 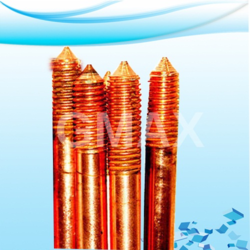 Coupling threads are formed by a Cold rolling process that provides thread strength hence maintain the integrity of the rod. 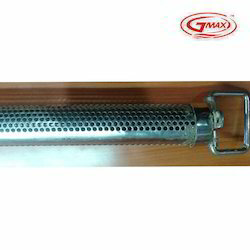 Being a manufacturer apart from our standard sizes we also provide customization as our our clients specification. 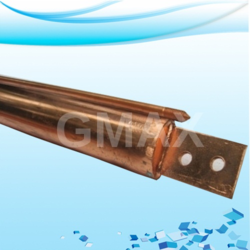 We are the manufacturer of Copper Earthing Pipe. which are specifically preferred by the customers for the neutral applications of Transformers, Generators, UPS, Servo stabilizers, etc. 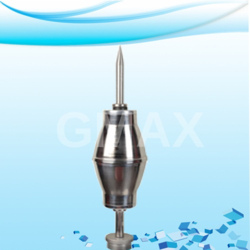 We are the manufacturer of ESE Lightning Arresters. 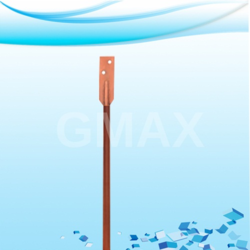 We are providingEarthing Material in best quality. 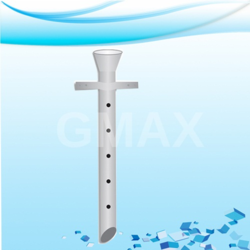 max exothermic welding powder consists of copper oxide and aluminum which is specific weight in grams for the connections should be made approximately 97 % of the contents of this cartridge is the weld metal, the remaining part is a starting powder which is tamped into the bottom of the each cartridge. We are also mfg. 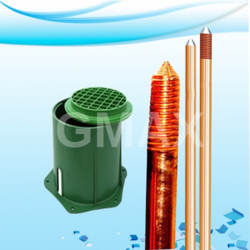 Earthing electrode, gel earthing, lightning arrester, surge arrestor.